Collection Héritage - Patou pour Homme (2013) is a popular perfume by Jean Patou for men and was released in 2013. The scent is spicy. It was last marketed by Designer Parfums. When Jean Patou began the process of relaunching its historic catalog of classics, one of the most awaited was Patou Pour Homme. Some perfumes end up gaining a mythical status after they are discontinued, with their stocks being sold to gold weight as soon as they become scarce and Patou Pour Homme is one of them. So it is natural that his return to the market was desired and, I believe, feared as well. Would the Heritage Collection version be up to the height of the original? Testing the perfume launched in the 80's, it's easy to see why it has become such a beloved creation. 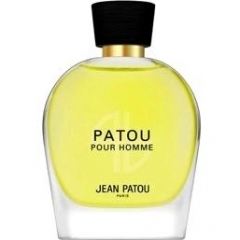 Patou Pour Homme is a complex, harmonic and rich perfume, a classic that does what the classics does best: play a melody that even if it is not new is harmonic and never gets boring. Despite being classified as an oriental fougere, its aroma is so rich that it gives edge to a spicy sand also chypre side, it all depends on how you interpret it. The opening has a spicy clove aroma amid a drier citrus. The civet, though present, is well balanced by the earthy scent of patchouli and the smell of rubbery leather, a leather that seems to depend heavily on the molecule isobutylquinoline. Although the oak moss is not declared in the notes, it is easy to see its earthy and moist presence mingling with patchouli, civet, leather and spices. The cooler and lighter fougere part is not so easy to be observed, with the freshness of the lavender and the herbaceous and sweet touch of the coumarine easily blending into the leather and patchouli aura. As much as Patou Pour Homme is a beautiful perfume, a chypre leather that brings me to classics such as Bandit, Azuree and Aramis Pour Homme, is a perfume that relies heavily on elements that have been severely restricted by IFRA over time. Perhaps because of this, the current version launched at Heritage sounds less complex and more direct, with a more evident focus on the classical fougere structure. This is a new Patou Pour Homme, which shares with the classic the name and the basic idea. The scent of moss, the rubbery leather, and the spicy tones are all gone. In its place, we have a more brilliant citrus opening, something that smells like lemon and bergamot right away. As it begins to evolve, the new Patou Pour Homme gains the clean, herbaceous contour of the combination of lavender, sage and coumarin, a very classic and timeless fougere aura. Jasmine is used as in a classic fougere, giving a subtle and subtle sensual floral tone. The base has a less earthy patchouli, it is more musky and has a light leathery aroma, something that perhaps reminds a little bit of suede in its aroma. Using the two of them one after the other it is clear that it is possible to appreciate the Heritage Collection version on its own merits, since if you see it as a re-release of the classic of the 80's it disappoints the most faithful and loyal fans. Unfortunately, reviving a perfume with the same characteristics of the original Patou Pour Homme is not only a project without guarantee of sales success, is also an illegal project by the restrictions established by the current regulatory bodies. Write the first Review for Collection Héritage - Patou pour Homme (2013)!